This is the final post in a series of three to explain how to use the FT232RL USB to UART Bridge to program a Cyclone II FPGA. The first part in the series describes how to compile and install the hardware drivers in Ubuntu that we need to use to access the FT232RL functions. The second part describes the hardware modifications and connections required to interface the FT232RL to SparkFun’s Cyclone II Breakout board. Let me give you a quick high-level overview of what we must do in order to configure the Cyclone II using the FT232RL, after which we will dive head first into all the juicy details. Convert the FPGA Config file from SOF to RBF (Raw Binary File) in Quartus. Read and process the .rbf configuration file into a serial bit stream. We then need to “weave” in the DCLK transitions to create a parallel byte stream which will be sent to the FT232RL. More on that in a bit. Open a connection to the FT232RL hardware, and configure it for Bit Bang mode operation. Trigger the Cyclone II into configuration mode. Push the bit stream to the FPGA. Once you “compile” (synthesis) an FPGA design in the Quartus II software, the tool generates a file which contains all the information required to configure your FPGA. However, the default file type is a .SOF which I’m not sure how to manage. However there are other file types available to use for configuration, so much so that Quartus II has a built in tool to convert between formats. We will be converting the SOF file to an RBF, Raw Binary File which appears to be easier to work with. Set the new file’s path and name. The final step is to click the “Generate” button. First, I just want to throw all the code out there for people who would like to copy & paste it in it’s entirety, next I’ll break it down and explain its components. ftdi.ftdi_set_baudrate(_ftdic,9600*16) #Not certain what is the fastest setting possible yet. #We set the current state of all 8 Bit-Bang pins of the FT232RL by sending it one byte. #      each bit in said byte cooresponds to one pin on the FT232RL. #So we need to convert the bits in the RBF file into bytes to send to the FT232RL, setting the DATA0 pin and then "clocking" it in. #The following generates the byte stream from the RBF file. #Basically, every config bit we send to the FPGA needs to be clocked in. #to send. Then take the DCLK high. Repeat for all bits in the file. NewData += chr(int(bits[bit]) | NCONFIG_HIGH) #Falling edge of the clock, this can probably be removed but I have to check the timing to be sure (setup/hold times). Alright, we’ll skip past the declarations for now and start with the code in the order it executes. If you are using a device other than the FT232RL you might need to modify the Product_ID in the ftdi_usb_open function. See the comments in the code for more details. The ftdi_enable_bitbang function configures the 8 bit-bang pins to either an Input or an Output. For this example I’m setting all 8 pins to be Outputs, hence the 0xFF. If you wanted all the pins to be Inputs you would send 0x00, and if you wanted half to be input and half output: 0xF0. According to the documentation this ftdi_enable_bitbang function is depreciated and favors the new function ftdi_set_bitmode. This new function wasn’t working for me, but maybe you’ll have more luck with it than I did. send the configuration data on the DATA0 pin one bit at a time. If you are using configuration data in RBF, HEX, or TTF format, send the least significant bit (LSB) of each data byte first. For example, if the RBF contains the byte sequence 02 1B EE 01 FA, you should transmit the serial bitstream 0100-0000 1101-1000 0111-0111 1000-00000101-1111 to the device first. Now, every bit we send on DATA0 needs to be clocked-in, which is why we set the DCLK low, put the data on the DATA0 pin, then take DCLK high. You can see for each configuration bit we want to send to the FPGA, we are sending 3 bytes to the FT232RL. And that is all there is to it! After running the code your FPGA should be up and running. I had a lot of problems initially because of Ubuntu’s security blocking me from accessing the FT232RL, so be sure to read my first post describing how to setup a udev rule to allow non-root access to the device. I recommend looking at the libftdi documentation as well as the Cyclone II Configuration documentation if you have any problems with the code and/or configuration process. Best of luck. Please leave a comment and let me know if this code has helped you, or if you have any questions. Chr(0) is just to give a byte with all zero’s to the FTDI driver. It doesn’t print out because an ascii 0 is a null. Quick question, which version of the libftdi are you running? Okay. I saw your message in the libftdi message group, seeing Jim’s response, your best bet might be reverting to the 0.18 version and applying my patch (Or just grab 0.19 which has it already included) or I suppose trying to pull the 1.x branch and see how that works. I had a quick peak at the ftdi.i file in the 0.20 branch and there are some huge changes from 0.18, I’m not expert enough in SWIG to know if they are correct or better though. Finally, i take SRunner and i will modified the C code to make it work with a µprocessor and not a ByteBlaster cable. It looks like this might be even cheaper than buying some nvram. Be sure to get a memory that is sized correctly for your application. And i emulate the SPI interface with the microcontroller to configure the flash memory. Do you think it’s possible ?? Currently in my setup all of the configuration data is stored on my personal computer so I don’t have any external memory connected. So, It might be worth looking into using something like a removable SD card, especially if your microcontroller has easy file access functions. hi, i just want to know what external memory you use to store the configuration of FPGA and how you interface this one. Because i try to configure a cyclone II in PS configuration with a microcontroller. thanks for your help and sorry if i make a mistake i don’t speak english very well. Could you give a sample of how to read the pins after applying the patch? I’m still having no luck. I haven’t had a chance to play with the latest builds now that I’ve moved on to using the DE0-Nano. I’ll take a look at this in the next couple of days, but you could also try dropping a message in that libftdi mailing list, they might get you fixed faster than I can. Hey Chris. Thank you so much for posting your code. I’ve played around with it for a bit. I’m having some trouble trying to perform pin reads over this interface, using the ftdi_read_pins(struct ftdi_context *ftdi, unsigned char *pins) function. 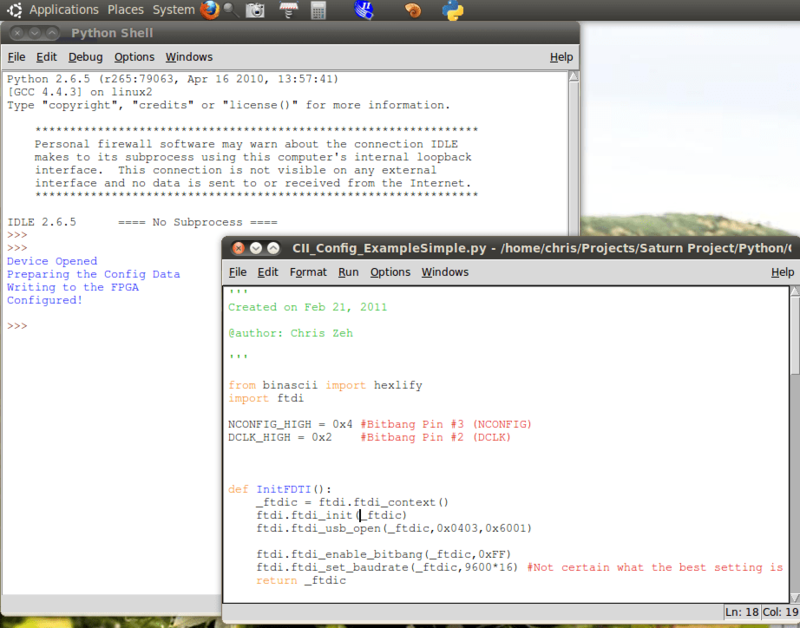 Something about trying to use pointers in python just never seems to work. I’m trying out the ctypes library but I’m still not having much luck. I think I might just port your programming procedure back into c++.